Do you guys like to keep your various groups of friends separate or do you let them mingle? Generally, I like to lump all of my friends together at dinners and parties – I figure all my friends like me, so they already have one thing in common. But, just this past weekend, two very dear friends of mine met for the first time. What made it even more interesting is that we invited them both to stay the weekend. Luckily they got along quite well and there were no fisticuffs. 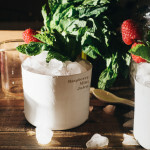 Instead there were homemade waffles, no-knead pizza and plenty of raspberry mint juleps. 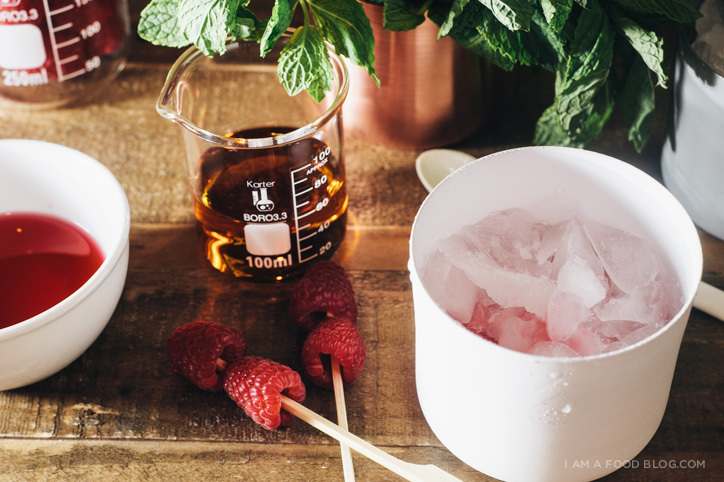 Raspberry mint juleps are similar to regular juleps: mint, bourbon, sugar and lots of ice. These guys have the added bonus of summer sweet raspberries. Give me any excuse for crushing ice and I’m in. 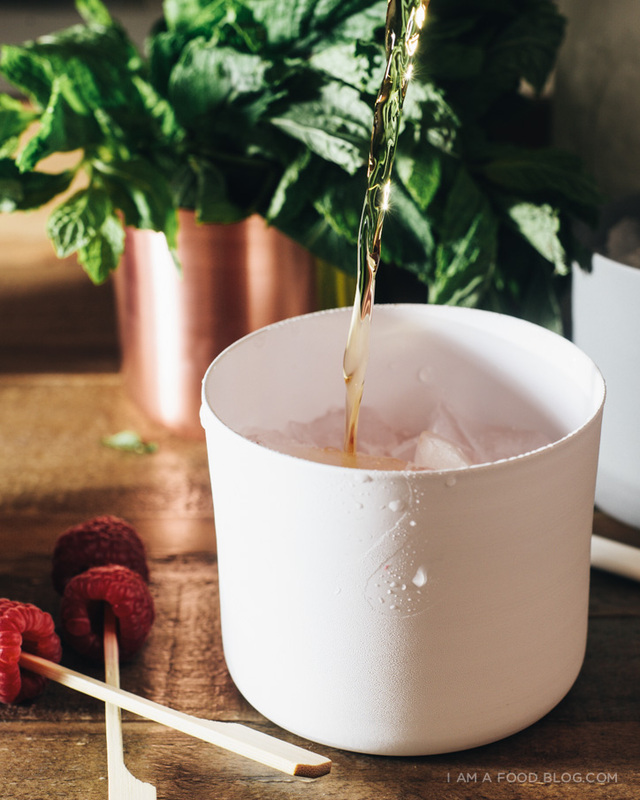 I know drink purists love those giant, hand crafted balls of slow melting ice, but there’s something so summery about a tumbler filled with crushed ice, especially if it’s topped off with bourbon! In a metal cup, add 1/2 an ounce of simple syrup. Place 4-5 mint leaves into the cup and muddle gently. Add 1/2 of the crushed ice and pour on the bourbon. Top with the remaining simple syrup and ice. Idealy, you should heap on the ice so it looks sort of like a snow cone. 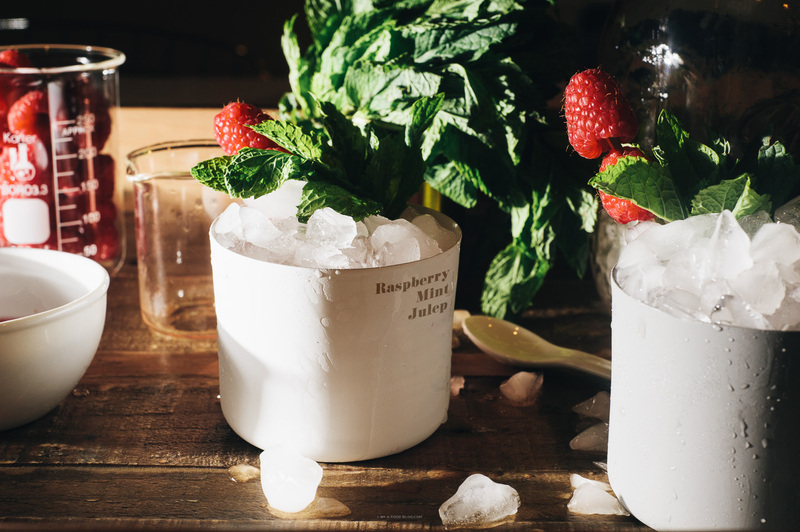 Garnish with mint and raspberries and enjoy immediately. In a small saucepan, bring the sugar, water and raspberries up to a boil over medium heat. Stir until sugar is dissolved, raspberries are muddled and syrup is bright pink. Strain out the raspberry bits, pressing down on them to release as much juice as possible. Chill before using. PS – Don’t you just love the tumblers I used? They’re from MAKR. PPS – The winner of the $50 Whole Foods gift card is Cindy M. Congrats! I’ll email you for details! i feel like i always stress out about my different groups of friends mingling, but it’s always fine in the end! especially with booze :) i am freaking in love with those cups you have in these photos! Yussss! You are speaking my cocktail language! I’m awful at friend mingling. I keep my friends separate and stress out about when they have to meet. But really, it’s all just in my head. Also I second Ms. Yeh up top ^^^ cute cups. Also love the beaker! 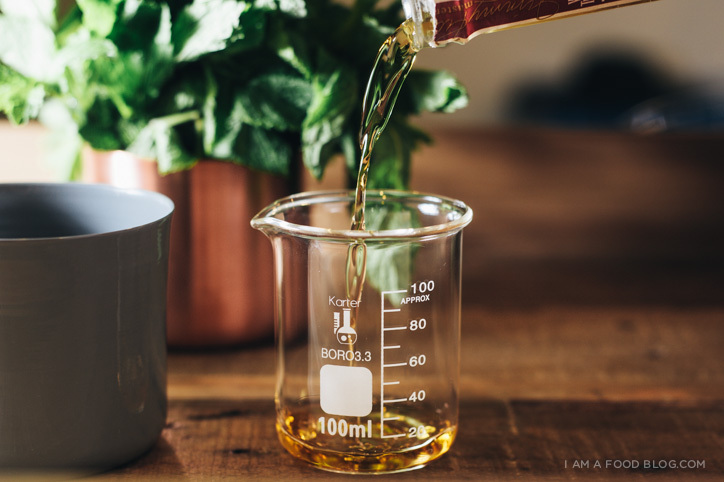 These sound so good and the tumblers and beakers are FAB! it stresses me out so i prefer to keep it separate but when it happens its usually fine? and crushed ice is the bomb. OK FINE you convinced me I need those tumblers AND I needed a mint julep, like, 2 hours ago. I love mingling my friends! Good people should know other good people! And I love this cocktail and those pictures. Oo these look perfect for an upcoming party I am hosting. Summery, tart & refreshing! Raspberry bourbon drink—-what an excellent recipe to present me—well to others too, but it’s all about me don’t you know. I am excited. This is sooooo easy. These are so very fun!! Here comes the weekend! Our groups of friends do not mingle well at all! A bunch of them just clam up and act like they’re having a terrible time. Even though I am only friends with wonderful and nice people, duh. Last year, I had two birthday parties — one for each group of friends. It was a huge success, plus — more parties all about me :) I will probably do that every year now!? That raspberry syrup is hella pretty and must be delicious! Love this drank! 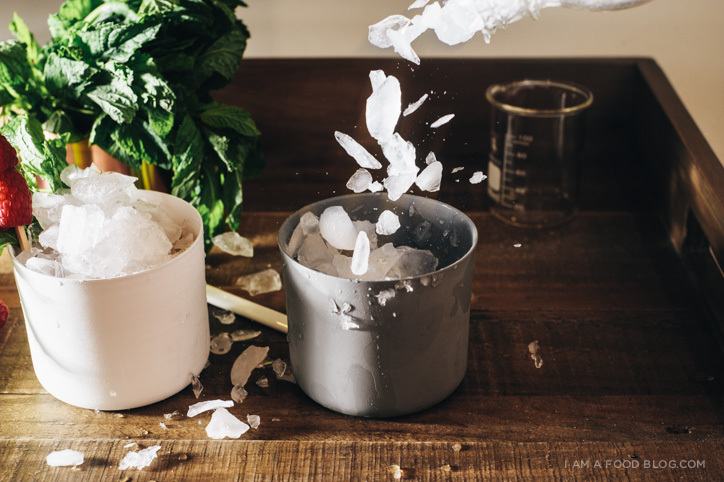 Crushed ice seems like so much colder than those spherical ice cubes…. seriously summery. Yum! Yes please, I’ll take all of it. I’m pretty sure I’d get totally wasted off one because you know, the high school freshman inside of me still isn’t used to alcohol, but I know I’d enjoy the hell out of it before I started taking really embarrassing selfies. The more the merrier right? I love mixing groups, it has always worked out better than I thought it would. And, the addition of a sweet drink like this would only help that along all the better. Great beakers by the way! The tumblers are cute, but I love that beaker the most. I need that in my life.